Wikimedia Commons has media related to Sports cars. The main article for this category is Sports car. This category is for individual models of Sports Car. For Sports Car makers see Category:Sports car manufacturers. Pages in category "Sports cars"
The following 200 pages are in this category, out of approximately 683 total. This list may not reflect recent changes (learn more). 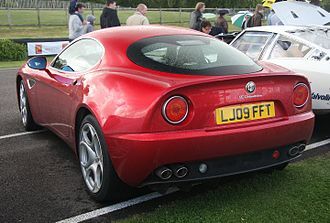 The Alfa Romeo 6C name was used on road and sports cars produced between 1927 and 1954 by Alfa Romeo, the 6C name refers to six cylinders of the cars straight-six engine. Bodies for these cars were made by such as James Young, Touring, Castagna. Starting from 1933 there was a 6C version with a factory Alfa body, in the early 1920s Vittorio Jano got a task to create a lightweight, high performance vehicle to replace the Giuseppe Merosi designed RL and RM models. The car was introduced in April 1925 at the Salone dell’ Automobile di Milano as the 6C1500, in the mid-1920s, Alfas RL was considered too large and heavy, so a new development began. The 2-liter formula that had led to Alfa Romeo winning the Automobile World Championship in 1925, the 6C1500 was introduced in 1925 at the Milan Motor Show, production started 1927, with the P2 Grand Prix car as starting point. Engine capacity was now 1487 cc, against the P2s 1987 cc, first versions were bodied by Young and Touring. In 1928, a 6C Sport was released, with a dual overhead camshafts engine and its sport version won many races, including the 1928 Mille Miglia. Ten copies of a supercharged Super Sport variant were made, the more powerful 6C1750 was introduced in 1929 in Rome. The car featured a top speed of 95 mph, a designed to flex and undulate over wavy surfaces. It was produced in six series between 1929 and 1933, base model had a single overhead cam, Super Sport and Gran Sport versions had double overhead cam engine. 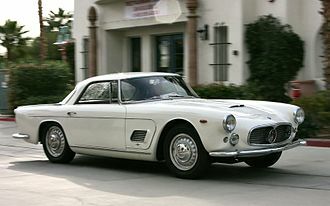 Most of the cars were sold as rolling chassis and bodied by coachbuilders such as Zagato, and Touring. The Alfa Romeo 6C1900 was the last derivative of the original 6C1500, produced in 197 examples during 1933, only made in Gran Turismo guise with a 2,920 mm wheelbase, the 6C1900 replaced the corresponding 6C1750 model. Besides the larger displacement, other notable changes were aluminium cylinder heads, an improved frame. The same upgrades were applied to the 1933 model 6C1750 Gran Sport, Alfa Romeo offered the 6C1900 with an in-house 4-door saloon body, while bespoke coachbuilt body styles included 4-seat cabriolets. The double overhead camshaft, naturally aspirated engine was bored from 66 mm to 68 mm. The Alpine A110 was a sports car produced by the French manufacturer Alpine from 1961 to 1977. The car was styled as a Berlinette, which in the era refers to a small enclosed two-door Berline. The Alpine A110 succeeded the earlier A108, the car was powered by a succession of Renault engines. Launched in 1961 the A110, like previous road-going Alpines, used many Renault parts, while its predecessor the A108 was designed around Dauphine components, the A110 was updated to use R8 parts. Unlike the A108, which was available first as a cabriolet and only as a coupé, the most obvious external difference with the A108 coupé was restyled rear bodywork. Done to accommodate the A110s larger engine, this gave the car a more aggressive look. Like the A108, the A110 featured a steel backbone chassis, the A110 was originally offered with 1.1 L R8 Major or R8 Gordini engines. The Gordini engine delivered 95 hp SAE at 6,500 rpm, the A110 achieved most of its fame in the early 1970s as a successful rally car. After winning several rallies in France in the late 1960s with cast-iron R8 Gordini Cléon-Fonte engines the car was fitted with the aluminium-block Cléon-Alu from the Renault 16 TS, with two two-venturi Weber 45 carburetors, the TS engine delivered 125 hp DIN at 6,000 rpm. This allowed the production 1600S to reach a top speed of 210 km/h, the long-wheelbase Alpine A108 2+2 Coupé ended its run and was replaced with a new, restyled 2+2 based on A110 engines and mechanicals called the A110 GT4. Notable performances from the car included a victory in the 1971 Monte Carlo Rally with Swedish driver Ove Andersson. With the buy-out of Alpine by Renault complete, the International Championship was replaced by the World Rally Championship for 1973, competition-spec A110s received engines of up to 1.8 litres. As well as being built at Alpines own Dieppe factory, versions of the A110 were built under license by various other manufacturers around the world. From 1965 to 1974 the car was produced in Mexico under the name Dinalpin by Diesel Nacional, in 1974 the mid-engined Lancia Stratos, the first car designed specifically for rally racing, was operational and homologated. The Alfa Romeo 4C is a small, rear wheel drive sports car. The 4C is the first mass-produced Alfa Romeo car to re-enter into the United States market, the 4C concept version unveiled in the 81st Geneva Motor Show in March 2011, followed by Mille Miglia 2011 parade, Goodwood Festival of Speed 2011,2011 Frankfurt Motor Show. It was displayed for the first time outside in Concorso dEleganza Villa dEste in 2012, compared to the production version, it is very similar, with the biggest differences being front lights, side vents and mirrors. The Alfa Romeo 4C Concept was voted the Most Beautiful Concept Car of the Year award by the readers of German magazine Auto Bild and it was awarded the Design Award for Concept Cars & Prototypes by referendum of the public in Villa dEste. The production car was unveiled at the 2013 Geneva Motor Show, followed by 2013 Essen Techno Classica, Goodwood Festival of Speed 2013, the bare 4C000 chassis was shown at the 2013 Geneva Motor Show. Ordering of European models began in October 2013 at Alfa Romeo dealerships in Europe, as part of Alfa Romeo 4C launch, Alfa Romeo Style Centre and Compagnia Ducale designed a 4C IFD Bicycle, inspired by the Alfa Romeo 4C coupé. The vehicle went on sale in December 2013 and marketed in Europe, production of 4C began May 2013 at Maseratis plant in Modena, with an expected production of up to 2500 units per year. It will be the first mass-produced Alfa Romeo car for re-entry into the US market, within the 3, 500-unit quota,1,000 units of which are earmarked for Europe. Delivery of European Alfa Romeo 4C Launch Edition took place at Balocco Test Centre, with vehicles delivered to Pierluigi De Silvestro, Philippe Walch, Carlos Diniz, Aldo Mariani, the car was designed by Centro Stile Alfa Romeo and developed by Alfa Romeo. The chassis is composed of a carbon fiber tub, with aluminium subframes front. The carbon fiber tub is produced by TTA in Airola, as a joint venture between Adler Plastic and Lavorazione Materiali Compositi, the carbon fiber components that make up the chassis are cut using CNC technology. The entire carbon-fiber monocoque chassis of the car weighs a mere 143 lb, the 4C has a single carbon fiber body, similar to the body of many supercars. There have been seven Ariel Atom generations to date, Ariel Atom, Ariel Atom 2, Ariel Atom 3 Ariel Atom 3.5, Ariel Atom 3S, Ariel Spec, Race Atom, and Ariel Atom 500 V8 Limited Edition. The current models are the Ariel Atom 3,3.5, the more powerful 3. 5R, the 3S, the Spec, Race Atom, the Ariel Atom features a prominently visible chassis and a drag coefficient of 0.40. Known as the LSC, it was developed at the university in 1996 with input and funding from various automotive industry members, including British Steel, the car was first shown publicly at the British International Motor Show at the NEC in Birmingham in October 1996. The Atom suspension setup was tuned by the engineers at Lotus, the Atom’s suspension derives from single seat racing cars and is fully adjustable, requiring only a spanner/wrench. Both front and rear double unequal length wishbones and inboard, pushrod-operated dampers contribute to the Atom’s dynamic handling, adjustable suspension rod ends feature inboard rubber/metal bushings to promote a more comfortable road-going ride. The front and rear Bilstein dampers are adjustable, stacked helper coil springs and main coil springs produce a low spring rate for minor deflections and a higher rate for large ones. In 2005 Track and Race Car magazine published the results of a comprehensive test of a range of cars, from the Porsche 911 Carrera S, Ford GT, BMW M5 to the Caterham CSR260. The supercharged Ariel Atom 2 won the 0–100–0 mph test by a clear margin at 10.88 seconds, ahead of the Caterham CSR260 and the Ford GT in fourth. The following year, the Atom won Autocars 0–100 mph challenge as the new Ariel Atom 2300 bhp supercharged edition achieved a time of 6.86 seconds, at the National Exhibition Centre in Birmingham, the Atom broke the indoor speed record. The high gloss floor that the cars ran on was only 220 m long, the driver of the Atom launched in fourth gear and still had wheelspin until the car reached 70 mph and started to get traction. Brammo Motorsports of Ashland, Oregon signed a deal with Ariel Ltd to manufacture the Atom in the US starting in late 2005. In the US the Atom 2 was available with the supercharged GM Ecotec engine, there was a limited run of 10 US-built Atom 2 cars in 2006-2007, which were powered by imported Honda K20As. Brammo Motorsports ceased production of the Atom in 2008 to focus on the manufacture of an electric motorcycle, TMI started production by building Honda-powered Atom 3 cars. TMI AutoTech Inc operates the Spec, RaceAtom Series at VIR, introduced in February 2008, the Ariel Atom 500 features a 500 horsepower 3. The engine weighs 90 kg and is coupled to a SADEV six-speed sequential gearbox to cope with the power over the Honda unit. During the development process the RS performance engine was replaced by a unit prepared by Hartley Enterprises giving the production version of the 550 kg car 909 bhp/tonne. Ariel claims this variant will accelerate from 0-60 mph in less than 2.3 seconds, in June 2014 a 3. 5R was presented to Avon and Somerset Police, the force local to the Crewkerne factory, to support a local motorcycle safety initiative. A sports car is a small, usually two seater, two door automobile designed for spirited performance and nimble handling. According to the Merriam-Webster dictionary, the first known use of the term was in 1928, Sports cars may be spartan or luxurious, but high maneuverability and minimum weight are requisite. The basis for the car is traced to the early 20th century touring cars and roadsters. These raced in rallies, such as the Herkomer Cup, Prinz-Heinrich-Fahrt. These would shortly be joined by the French DFP and the Rolls-Royce Silver Ghost. In 1921, Ballot premiered its 2LS, with a remarkable 75 hp DOHC two liter, designed by Ernest Henry, capable of 150 km/h, at most, one hundred were built in four years and this was followed by the SOHC 2LT and 2LTS. The same year, Benz built a supercharged 28/95PS four for the Coppa Florio, duerkopps Zoller-blown two liter in 1924, as well. There was a clear cleavage by 1925, by the end of the 1920s, AC produced a 2-liter six, the 3. Benz introduced the powerful SS and SSK, and Alfa Romeo, hispano-Suizas Alfonso XIII is considered the first sportcar developed between 1911 and 1914. Two companies would offer really reliable sports cars, Austin with the Seven, the drive train and engine layout significantly influences the handling characteristics of an automobile, and is crucially important in the design of a sports car. The front-engine, rear-wheel-drive layout is common to cars of any era and has survived longer in sports cars than in mainstream automobiles. Examples include the Caterham 7, Mazda MX-5, and the Chevrolet Corvette, more specifically, many such sports cars have a FMR layout, with the centre of mass of the engine between the front axle and the firewall. In search of improved handling and weight distribution, other layouts are sometimes used, the RMR layout is commonly found only in sports cars—the motor is centre-mounted in the chassis, and powers only the rear wheels. Some high-performance sports car manufacturers, such as Ferrari and Lamborghini have preferred this layout, Porsche is one of the few remaining manufacturers using the rear-engine, rear-wheel-drive layout. 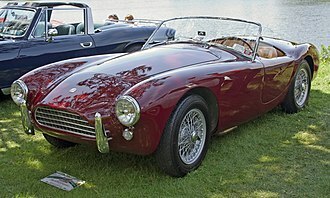 AC Ace is a car which was produced by AC Cars of Thames Ditton, from 1953 to 1963. It was hardly a sporting engine, and it was felt that more modern. Joining the Ace in 1954 was the Aceca hard top coupé, from 1956, there was the option of Bristol Cars two-litre 120 bhp straight-six with 3 downdraught carburettors and slick four-speed gearbox. Top speed leapt to 116 mph with 0–60 mph in the nine second bracket, overdrive was available from 1956 and front disc brakes were an option from 1957, although they were standardised. In 1961 a new 2. 6-litre straight-six Ruddspeed option was available and it used three Weber or SU carburettors and either a Mays or an iron cast head. This setup boosted the cars performance further, with some versions tuned to 170 bhp, providing a top speed of 130 mph, however, it was not long before Carroll Shelby drew ACs attention to the Cobra, so only 37 of the 2.6 models were made. These Ford engined models had a grille which was carried over to the Cobra. With the engine set well back in the chassis, the Ace handled well and was successful in competition, the car raced at Le Mans in 1957 and 1958. The Alpine A108 was a light-weight glass-fibre bodied, rear-engined two-door coupé produced for a young competition-oriented Dieppe based Renault dealer called Jean Rédélé. The car replaced the Alpine A106 and was based on components from the Renault Dauphine. The 108 was launched at the Paris Motor Show in autumn 1957, but initially production volumes were low, the Alpine 106 had taken its name from the first three digits of the four-digit homologation number of the old Renault 4CV on which the car was based. In this form, where the 106 had used an engine from the Renault 4CV,1960 saw the introduction of an Alpine 108 cabriolet and a 2+2 coupé called the GT4. This basic architecture would be used for Alpine sports cars until the Alpine A110 was phased out in 1977 and these models, like the original coupé, were assembled by Chappe et Gessalin, but with a wheelbase lengthened by 7 cm. The mechanical elements were as before, with the Renault Dauphine engine offered in 845 or 904 cc form, by the time production of the 108 came to an end in 1965, fewer than 100 of these lengthened versions had been produced. Lopresto's 6C 1750 GS Zagato/Aprile at the Rétromobile show in Paris, 2015. 2300 engine with Roots supercharger. 1972 2000 GTV in a vintage race at Watkins Glen International. Spider "Type 4" in the rare "Vinaccia Red". 1969 AMC AMX in "Matador Red"